Giannis and Harden threw down in an MVP showcase, Anthony Davis joined the party, Kyle Kuzma had fun in 3 quarters, and Marc Gasol lives! The Usual NBA Suspects - Giannis Antetokounmpo, Anthony Davis and James Harden – all went off, Kyle Kuzma joined some rare air, and welcome back Marc Gasol! 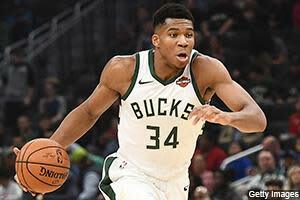 Bucks 116, Rockets 109 – In the MVP Showcase and game of the night, Giannis Antetokounmpo had 27 points, a career-high 21 rebounds, five assists and a steal leading the Bucks to the win. Malcolm Brogdon hit 9-of-12 shots for 24 points, five boards, three assists and a steal, and Khris Middleton and Eric Bledsoe both had solid fantasy lines. Brook Lopez was quiet and in foul trouble, while Ersan Ilyasova and Sterling Brown both played well off the bench. Outside of the greatness of Giannis and the strong season from Brogdon, there’s not much else to talk about here. James Harden, of course, had 42 points, 11 rebounds, six assists, two steals, a block, six 3-pointers and nine turnovers. It’s hard to be too mad at a guy who’s scored at least 30 points in 14 straight games for the ridiculous turnovers, but they are annoying. Clint Capela’s been alternating really good games and great games, and had another double-double tonight with 18 points and 13 boards, and is averaging 22 points, 15.4 rebounds and 1.2 blocks over his last five. P.J. Tucker calmed down for this one after Monday’s explosion, but still stuffed the stat sheet, while Austin Rivers and Gerald Green were both solid. All three players are worth a look (over Danuel House) while Chris Paul and Eric Gordon are out. Pelicans 140, Cavaliers 124 – Anthony Davis went off, as usual, with a 38-13-7-2-4 line with a 3-pointer, hitting 11-of-17 shots and 15-of-16 free throws. Julius Randle stayed relevant with 17 points, eight boards and two blocks, despite the return of Nikola Mirotic (ankle), who had 17 points, four boards and four 3-pointers in 22 minutes off the bench. Miro will probably eventually slow down Randle, and should be grabbed if he is somehow available in your league. Frank Jackson had a career-high 19 points and four 3-pointers after scoring 17 on Monday, and he’s stepping up with E’Twaun Moore (leg) out. I don’t know how long it’ll last, but Jackson’s worth a look right now. The Pels have won three straight (Cavs, Grizz, Cavs), but their next five are on the road and mostly against better teams. Cavs starters Alec Burks (17 points), Collin Sexton (2-of-12), Tristan Thompson (6-10-5) and Cedi Osman (10 points, 2 threes) are all worth a look right now, while Jordan Clarkson looks like a hot pickup off the Cavs bench, scoring at least 21 in three straight. Cameron Payne, Ante Zizic and Matt Dellavedova played well last night, but I’m not interested right now. I think Thompson, who played through a foot injury, is a must-own player with Larry Nance out for a while. The Cavs have lost 11 straight and blew a 16-point lead. Lakers 113, Pistons 100 – Kyle Kuzma had a career-high 41 points and five triples on 16-of-24 shooting, and didn’t even play in the fourth quarter. He also didn’t do much more, but he’s clearly the Lakers best offensive weapon not named LeBron. He joined James Harden, Stephen Curry and Klay Thompson as this season’s 40-point scorers in three quarters. Kuzma’s back was wrapped on the bench in the fourth, so make sure he’s good to go for the next one. Brandon Ingram had six dimes for the second straight game, Lonzo Ball had 11 assists, and Josh Hart disappeared, hitting just 1-of-3 shots. I’m still going to ride Hart until LeBron James (groin) is back. Michael Beasley somehow had 19 points in 19 minutes on 9-of-13 shooting, but I’m not taking the bait, Kentavious Caldwell-Pope came through with a 15-6-4 line with a 3-pointer, and Ivica Zubac had 11 points, nine boards and a steal. I really don’t see any automatic pickups here, but KCP might be ready to get hot again. For the Pistons, Blake Griffin (16 points & 6 assists, with zero rebounds for the first time in his career), Andre Drummond (2-of-12, 17 boards), Reggie Jackson (15 & 5) and Reggie Bullock 13 points, 2 3-pointers) all put up some numbers, while Langston Galloway and Luke Kennard hit double figures off the bench. Bullock’s scored at least 13 in four straight, making him worth a look. Wizards 123, Sixers 106 – The Wizards overcame some big stat lines from the Philly stars to get an unlikely win, led by Bradley Beal’s 34 points and full stat line, including six triples. Trevor Ariza had 17 points, five boards and two steals, Tomas Satoransky had five rebounds, 11 assists and three steals on a 1-of-6 shooting night, and Otto Porter Jr. played through his hand injury and scored 23 off the bench. Thomas Bryant started again, but lasted just 14 minutes to finish with nine points and six rebounds. I don’t know why they’re giving up on Bryant, but his minutes have taken a nosedive. Ian Mahinmi played 25 minutes and had six points, eight rebounds and five steals, and has outplayed Bryant for three straight games. If you want to pick up Mahinmi, go for it, but my hope is Bryant’s minutes will be back soon. Jeff Green had an 8-5-3 line with a block and two 3-pointers in 25 minutes, and is still worth holding. For the Sixers, Wilson Chandler did nothing, as usual, while Joel Embiid (35-14-2-1-3), Ben Simmons (15-10-8-2) and Jimmy Butler (23-9-2-2) all put up big numbers. Furkan Korkmaz got another start for J.J. Redick (back) and had 16 points, five boards, two assists, two steals and four 3-pointers in 26 minutes. He’ll take a hit once Redick is back, but has played really well in four straight games. The Sixers bench was invisible in this one and Tuesday’s hero, Landry Shamet, hit 2-of-7 shots for five points after hitting eight 3-pointers and scoring 29 in his previous game. Korkmaz is probably worth picking up, but I’m worried about what will happen when Redick’s back. Jazz 106, Magic 93 – Rudy Gobert double-doubled, Joe Ingles bounced back with 16 points, seven assists, a steal, a block and four 3-pointers, and Donovan Mitchell went off for 33 points, four boards, seven dimes and four 3-pointers. Raul Neto, starting for Ricky Rubio (hamstring) missed all five of his 3-pointers for 10 points, three boards, three assists and a steal, and is worth using as long as Rubio’s out, despite the rough night. He played 31 minutes and is the only healthy PG in Utah. Jae Crowder played 34 minutes for nine points and not much else, and he’s looked pretty rough over his last three games. I’m glad I don’t own him, actually. For the Magic, Aaron Gordon had his first double-double of 2019, but didn’t have a steal or a block. If you want to move him, now might be your chance. Nikola Vucevic and D.J. Augustin both had big games, and I was glad to see DJA come through, breaking out of a funk. And speaking of funks, Evan Fournier was 0-for-8 for one point in 37 minutes after scoring in double figures in each of his previous four games. Jonathan Isaac was quiet again and, like I said in my YouTube video, I’m fine with dropping him if you want to, while Terrence Ross had 13 points, five boards, a steal and three 3-pointers off the bench. He’s playing well again and is worth a look. The Magic blew a 21-point lead in this one and Mo Bamba was out with a sore foot. Nets 116, Hawks 100 – Joe Harris (ankle) was back and scored 16 points with nine boards and four 3-pointers, and Jared Dudley went down with a hamstring injury. The Nets are banged up (Dudley, Allen Crabbe, Rondae Hollis-Jefferson), so Harris could be ready to go on a tear. D’Angelo Russell bounced back from an off night with 23 points, and Rodions Kurucs and Jarrett Allen were effective starters. Kurucs is also worth a fantasy look with the Nets so banged up. Ed Davis had a season-high 16 rebounds off the bench, DeMarre Carroll (knee) was back for 17 points and a couple 3-pointers, while guards Spencer Dinwiddie and Shabazz Napier played well off the bench. Carroll could start for Dudley, so your potential pickups, in order, are Harris, Carroll, Kurucs, Napier and Davis. John Collins matched his career high with 30 points, 14 boards, a steal and a 3-pointer. After picking up just one steal on the entire season, he now has four in his last three games. Baby steps. DeAndre’ Bembry fizzled, missing all six of his shots after a big game, but played 28 minutes and I’m still into him. Trae Young was 2-of-9 from downtown with six turnovers, but also had 17 points and seven dimes. And that, my friends, is Trae Young. Kevin Huerter was back and had 14 points and 10 boards, despite not hitting a 3-pointer. Huerter and Bembry are both worth owning as long as Taurean Prince and Kent Bazemore (ankles) are out. Jeremy Lin is also worth a look and had a 16-5-3-3 line in his return to the bench. Celtics 135, Pacers 108 – The Celtics got big games from Marcus Morris and Jayson Tatum, Al Horford was in foul trouble, Kyrie Irving was quiet, and Marcus Smart only had two points after a couple big games. And the Celtics still destroyed the Pacers for their fourth straight win. Jaylen Brown had 22 points and a fun line off the bench, while Terry Rozier, Gordon Hayward and Daniel Theis all played well off the bench. This was a blowout, but Hayward is starting to look like the old Hayward. For the Pacers, Domantas Sabonis filled in nicely for Myles Turner (shoulder, maybe he’ll play Friday?) with a 20-7-5 line, and Victor Oladipo scored 17 with three 3-pointers, but didn’t do much else. Oladipo’s last three games have been pretty disappointing and it’s probably not a coincidence that Turner’s been out for all of them. Bojan Bogdanovic and Darren Collison were also disappointing, as was the entire Pacers bench in this one, although Tyreke Evans had 15 points and five dimes. I’m going to say it was garbage-time related. Kyle O’Quinn added 11 points and five boards, getting some run with Turner out, as well as the lopsided score. Blazers 124, Bulls 112 – Jusuf Nurkic (18 & 8), Damian Lillard (16 & 10) and C.J. McCollum (24 points) all played well in the win, Al-Farouq Aminu was quiet (and has been for three straight games), and Jake Layman started for Moe Harkless (knee), but had just two points in 17 minutes. Reserve Zach Collins had a nice night with 16 points, nine boards, four assists, a steal, a block and two 3-pointers before fouling out, and Seth Curry scored 17 with three triples off the bench. Curry’s played well in three of his last five, but will have a tough time breaking through as long as CJM and Lillard are healthy. As for Collins, he’s seen 20-plus minutes in back-to-back games and could be getting hot, making him worth a look in deeper leagues and DFS. Lillard tweaked his elbow, but it doesn’t appear to be anything serious. For the Bulls, Wendell Carter Jr. went off for 22 points and six boards on 7-of-9 shooting, just three games after his ‘DNP-Introspection.’ Hopefully, you didn’t cut him. Lauri Markkanen, Kris Dunn, Zach LaVine and Bobby Portis were all effective, and Chandler Hutchinson fizzled in another start, and is simply not worth owning at this point. Antonio Blakeney had 12 points off the bench, but there’s nothing to see here. Mavericks 104, Suns 94 – Maxi Kleber started for Dennis Smith Jr. (back) and had a fun 13-9-1-1-2 line with two 3-pointers in 34 minutes. The points and boards were season highs and I love him, but he doesn’t get enough minutes. And if you’ve had it up to ‘here’ with DSJ, feel free to drop him. Rookie Luka Doncic, who still looks like a five-year NBA veteran to me, racked up 30 points, six rebounds, five boards, three steals and four 3-pointers in the win. I love that kid. For the Suns, it was more of the same. T.J. Warren is really good, Josh Jackson is really coming on, Mikal Bridges doesn’t do much with big minutes, De’Anthony Melton fills the stat sheet without it killing it anywhere, and Deandre Ayton had a rare quiet night with six points and five boards on 1-of-7 shooting. He’ll be fine and said he’d apologize to his teammates for being a “bad egg.” Richaun Holmes had a big night (as a result) and Kelly Oubre had 14 points, two steals and a block in 33 minutes, and is worth picking up. And we had an Elie Okobo sighting (10-4-3), but there’s no reason to get excited as long as Melton is starting. Melton, who fouled out, should be held until further notice, Jackson looks like a must-own player these days, and Oubre is worth picking up in most leagues. And no, I don’t know when Devin Booker (back) is playing again, and yes, I’m worried about him being shut down at some point later this season. Grizzlies 96, Spurs 86 – Welcome back, Marc Gasol! He blew up for 26 points, 14 rebounds, three assists, a steal, a block and three 3-pointers on 9-of-16 shooting against his brother, Pau, and the Grizzlies won as a result. Hopefully you didn’t drop him during his nasty slump. Mike Conley had 15 & 6, JaMychal Green double-doubled off the bench, Jaren Jackson Jr. (foul trouble) scored 12 and Shelvin Mack added 10 off the bench. Justin Holiday had six points, three boards and a block in 21 minutes, and just isn’t doing much of anything, and I’m not going to hold my breath for him to start. Kyle Anderson played a quiet 33 minutes, but I’m still on board. For the Spurs, the box score is pretty ugly. Rudy Gay was out with his wrist injury again, Bryn Forbes led the way with 14 points and three 3-pointers, Marco Belinelli also scored 14 off the bench, Patty Mills and LaMarcus Aldridge each scored 13, and Derrick White had 12 points, but none of their stat lines were eye popping. DeMar DeRozan cooled off after a hot streak, scoring just nine points on 4-of-15 shooting. Forbes and White are worth a look in all leagues, but this box score was a disaster.